Despite seemingly contradictory priorities, China will continue to pursue a prudent monetary policy that ensures sufficient liquidity to support economic growth and prevent financial risks as well as keep the renminbi’s exchange rate at a reasonable equilibrium, Chinese officials said on Sunday, March 10. At a wide-ranging press conference on the sidelines of the ongoing two sessions in Beijing, top officials from the People’s Bank of China (PBC) stressed that China will stick to a timetable for further opening up its financial sector and reduce interference from rising trade tensions. “We don’t mention ‘neutral’ this time, which is more concise, but the fact is the meaning of our prudent monetary policy has not changed,” said PBC Governor Yi Gang when asked whether the absence of the word “neutral” from this year’s monetary policy statement meant more monetary easing. In this year’s Government Work Report, Premier Li Keqiang said that “prudent monetary policy will be eased or tightened to the right degree.” That sparked speculation that facing downward pressure, China might resort to monetary easing that would raise corporate leverage, which, officials say, had been contained through efforts to stave off financial risks. 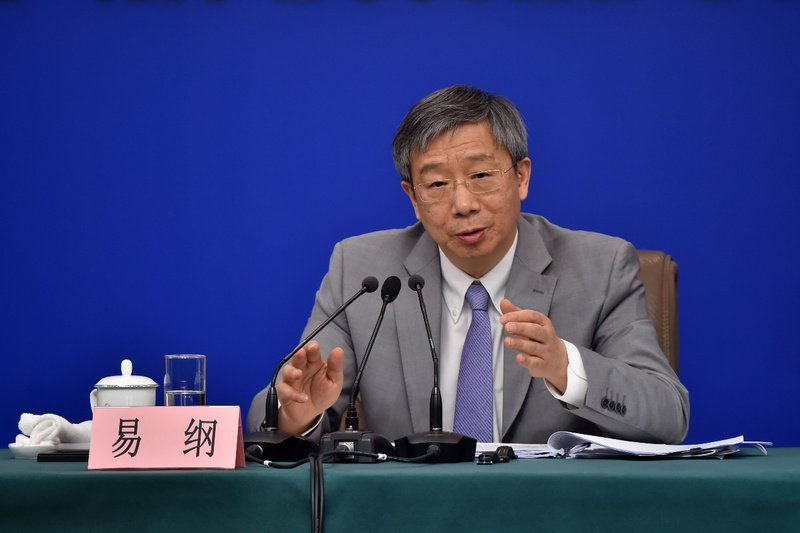 “To keep a balance between fending off risks and supporting economic growth will be the most important and challenging job for the central bank this year,” Sun Lijian, a professor of economics at Fudan University in Shanghai, told the Global Times on March 10. “The central bank can’t open the floodgates of the money supply, which will prop up asset prices, while also ensuring sufficient liquidity to support the real economy,” he said. To maintain sufficient liquidity, while avoiding a money supply deluge, growth in total social financing and the broad money supply, or M2, will be kept at a similar pace as nominal GDP growth, according to Yi. Dong Dengxin, director of the finance and securities institute at Wuhan University of Science and Technology, said M2 growth of about 8 percent for 2019, slightly lower than the 8.1 percent of 2018, “should be reasonable,” while noting that PBC might use “other flexible instruments to control liquidity as needed.” Yi suggested further cuts to the reserve requirement ratio (RRR), the amount of cash banks is required to keep as reserves, is possible, saying that there was still room for RRR cuts, though smaller than in previous years. China has cut RRR five times since 2018 to about 12 percent, which is about the same level as the limit in the US and Europe, Yi noted. Despite challenges at home and rising trade tensions abroad, China will stick to a timetable for further opening its financial sector to foreign investors, the PBC chief said, noting that many areas, including credit rating and bank card clearance, have already been opened to foreign companies. “We believe opening the Chinese financial market is beneficial to China and to the world, so we will resolutely push forward [opening measures] in accordance with the timetable,” Yi said when asked whether a trade war with the US would affect China’s financial opening. “We should rationally view trade tensions externally,” he said. “The timetable for financial opening is set based on the needs of China’s reform and opening-up, so there is relatively less interference for us.” Dong of Wuhan University of Science and Technology noted that China would likely focus “the breadth and depth” of its financial opening by increasing foreign participation in areas such as stocks and bonds. “We have opened a lot of the area but the scale of foreign capital is still relatively small,” Dong said. China should open the financial sector at its own pace and not be affected by foreign pressure, Dong said. Pan Gongsheng, a deputy governor of the PBC, noted at the same press briefing on March 10 that foreign capital only makes up 2.7 percent of investment in stocks and 2.3 in bonds. “While our stock market and bond market are very attractive to foreign capital, we are still at an early stage of opening and the level of openness is still not high,” Pan said. PBC chief Yi said March 10 that the two sides have reached consensuses on “key issues” regarding foreign exchange rates and talked about respecting each other’s autonomy in setting monetary policy and honoring the commitment made at the G20 such as avoiding a currency devaluation competition. “I want to stress that we will never use the foreign exchange rate for competitive purposes or use the foreign exchange rate to increase China’s exports or use it as a tool in trade tensions,” Yi said.